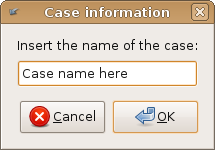 The possibility of a simple communication of the results of the digital analysis is an important feature provided by CAINE at the end of the investigation. The idea is to create a well structured and understandable report, and to avoid unnecessary technical details and digressions. During the phases of collection, examination and analysis, a digital investigator can write notes and reports that record the main characteristics of the examination process, some partial conclusions and the most important recovered information. These examination notes must be preserved until the end of the investigation case, when they are set up in a clear and complete report. We recall that a digital investigator may be required to testify about not only the examination results, but also about the validity of the procedure conduct and his qualifications to carry out the investigation. 1. Click on Create report to begin the investigation. 4. 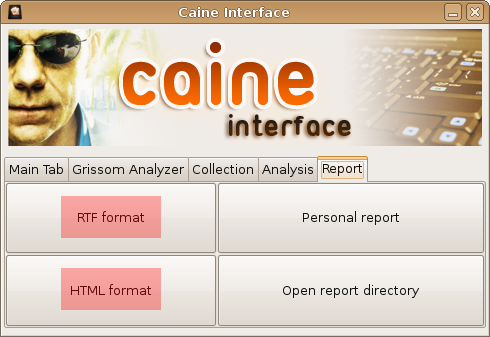 Proceed with the investigation using the tools inside CAINE. 5. 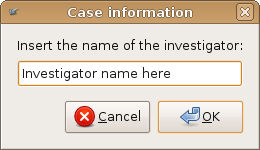 At the end of the investigative process you can retrieve your report in the “Report” tab, choosing the format you prefer or adding a personal note to the report (Personal report button). 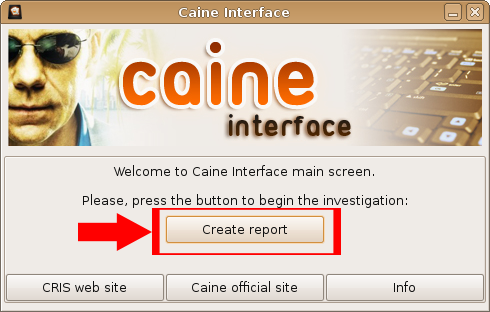 CAINE will also ask you to select the directory and the language of the report. 6. Finally you can explore the directory pressing the button Open report directory. This site is licensed under a Creative Commons License | Privacy & cookies.